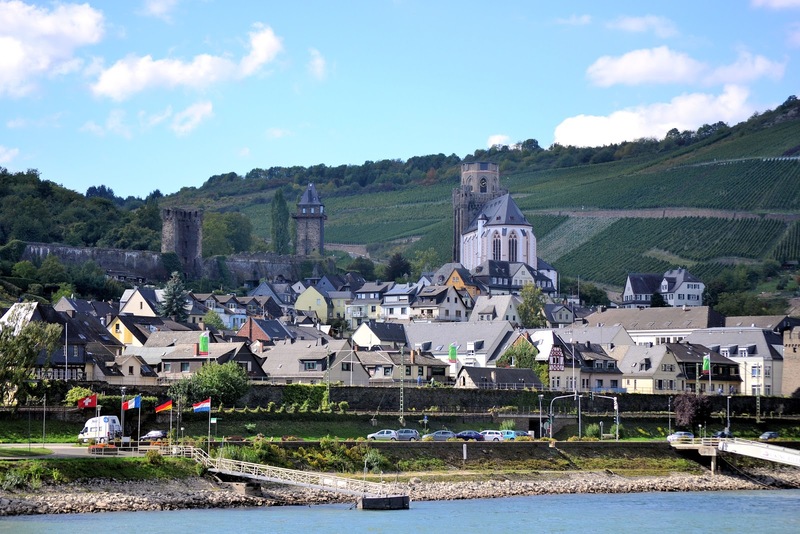 A voyage to the past and present on the Rhine River in Germany. This view of the River and the village of Spay on the opposite bank was taken from Marksburg Castle. All photography is the property of EuroTravelogue™. Unauthorized use is prohibited. 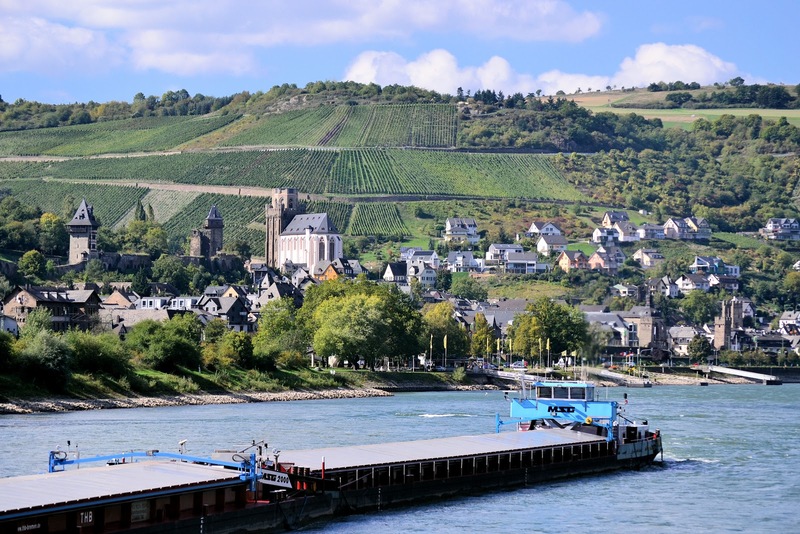 Old Vater Rhein (Father Rhine) is how Germans know their beloved river but now he's an acquaintance of mine as well, ever since my Rhine Getaway voyage with Viking River Cruises on board our Viking Longship, "Viking Mani." We sailed through four countries, from Amsterdam to Basel, and in between, visited iconic cities, medieval cathedrals, fairy-tale villages; and charted a course back in time; to when princely bishops and robber barons, ruled from on high the banks of the River Rhine. This is a story about the latter, that intrepid voyage on the Romantic Rhine, a stretch of the venerable river between Koblenz and Rüdesheim that has captivated the imaginations of artists, writers, composers and poets, and travelers alike with its castle-studded hills, storybook hamlets, climbing vineyards and forested slopes—a visual romance of which I had never seen the likes ... until now. Flowing for 766 miles from the Alpine peaks of Switzerland to the flatlands of the Netherlands, the Rhine River valley is steeped in history dating back 2,000 years when it marked the northern border of the Roman Empire. As time marched on through the Middle Ages, dukes and prince bishops built mighty fortresses to collect tolls, legally and illegally, along one of the most heavily-traveled trading routes in Europe. King Rudolf of Habsburg conquered most of the robber barons by the end of the 13th century when many of the castles met their fate, and if any of them survived, Louis XIV saw to their destruction when he swept through in the latter 17th century during the Palatinate War of Succession, aka Nine Years War claiming the territory for France. But then the 19th century arrived and with it, the "Romantic of the Rhine" movement, a time when travelers as well as artists, writers, composers and poets sought inspiration in this celebrated valley—Lord Byron, Wagner, Victor Hugo's "The Rhine," Heinrich Heine's "Loreley," Johann Wolfgang von Goethe who penned his "Geistesgruß" (Greetings from a Ghost)—among others. It is this legacy that fills our imaginations as we voyage along the romantic Rhine. The Romantic of the Rhine movement also engendered a renaissance for many a ruined castle, a rise from the ashes to be reborn into the stately palaces of the past. As a result, most of what stands today dates back only to the 18th or 19th centuries—all save one. Marksburg Castle was our first stop on our day of castle adventures. Looming above the village of Braubach, Marksburg Castle is where our castle adventures began on a morning excursion that was included in Viking's Rhine Getaway itinerary. 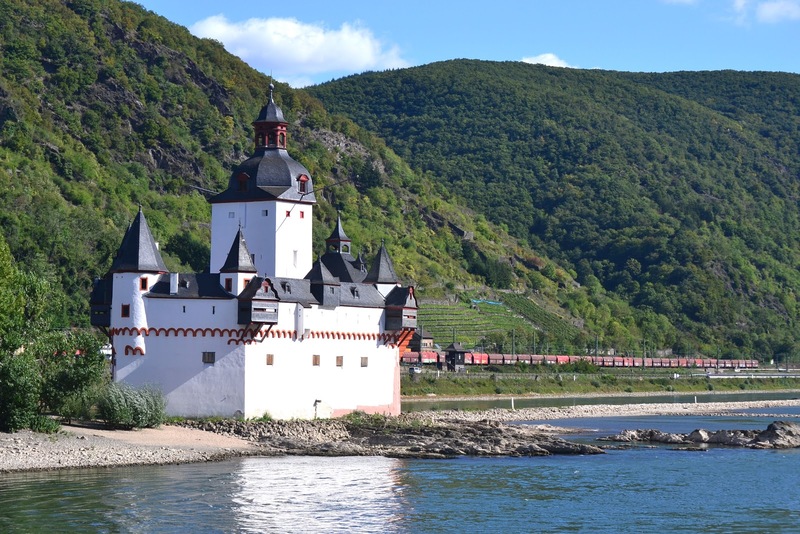 The only fortress to have escaped destruction as well as renovation since it was built 900 years ago, Marksburg dates back to the early 12th century when Braubach noblemen gifted ownership of Burg Braubach to the House of Eppstein, one of the region's most powerful dynasties of the time. 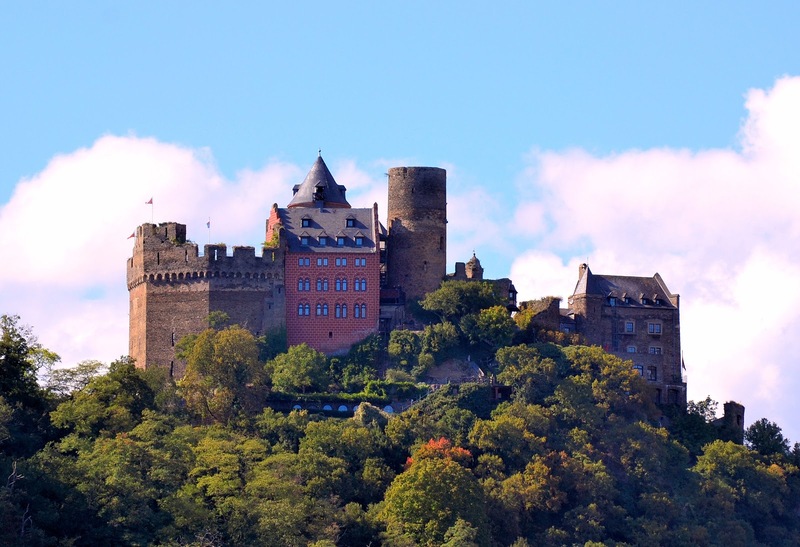 Tracing the lineage of the Marksburg Castle from the Lords of Eppstein at the far right to the German Castles Association, a span of 900 of years. 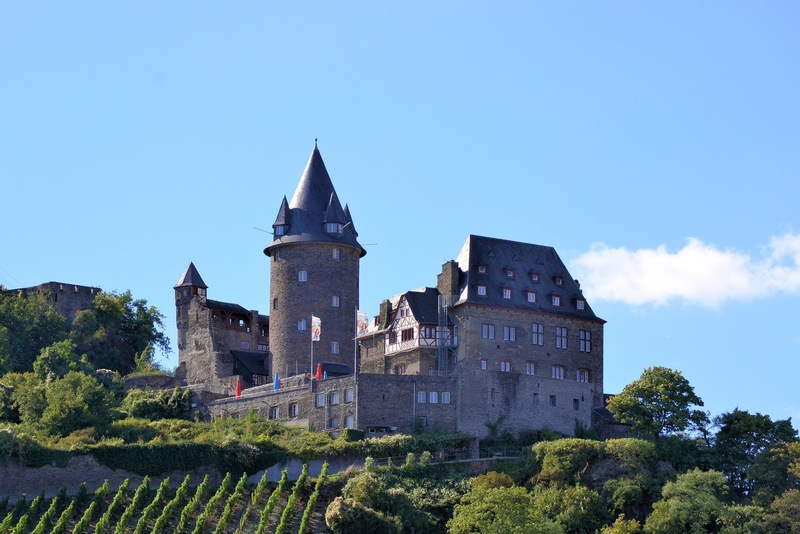 In 1283, ownership was transferred to the Counts of Katzenelnbogen who owned the castle until 1479 and were responsible for building the Gothic Hall, Chapel Tower and Romanesque Palas—residential quarters, room and administration. Following the counts, possession then fell to the Landgraves of Hesse; then to the Duchy of Nassau in 1803 when the old German Empire broke up. During that time, it was used as a home for disabled soldiers as well as a prison. In 1866 following the Austro-Prussian War, the Prussians used Marksburg as an apartment residence but sadly allowed the castle to fall into disrepair. Thankfully in 1899 and with the help of Kaiser Wilhelm II, architect and castle enthusiast Professor Bodo Ebhardt established the Deutsche Burgenvereinigung (Association for the Preservation of Castles) which purchased Marksburg in 1900. 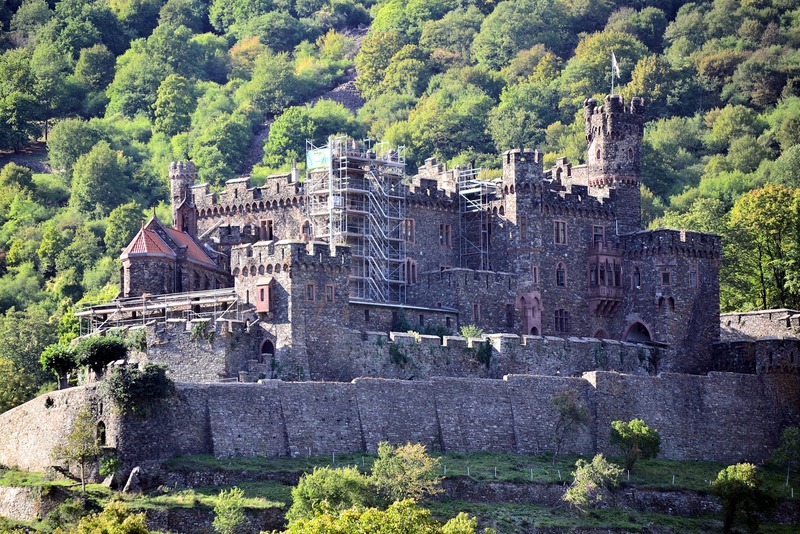 Today, the castle is home to the German Castles Association whose mission remains the same. Marksburg Castle as seen from our Viking longship. As we ambled up the horse-rider's staircase—a rough-hewn series of stone steps leading up the central courtyard—I imagined a knight in shining armor upon his sturdy steed galloping up these ramparts to the castle keep. With every step in our procession, we traveled back in time through a series of gates and pathways—concentric circles designed to impede an enemy's advance to inner castle which is actually the oldest section dating back to c. 1200. The keep's lower section was built in 1239 while its upper in 1468. The Marksburg Palas or Romanesque Great Hall dates back to 1239. Six coats of arms hang in succession on the wall along the way, paying homage to previous keepers of the fortress mentioned above. From there, we continued our trek back in time as we ventured inside the castle keep and toured the rest of the interior rooms, some of which contained original furnishings. The Gothic hall comprises the bed chambers; the kitchen (which can be booked for medieval themed dinners); and the Knights Hall with adjacent bathroom that locked from the outside to prevent intruders (brace yourselves) from crawling through the sewer pipe and into the castle. Dedicated to Saint Mark, the adjacent Chapel Tower contains the chapel whose decor spans a period of 700 years—its ceiling paintings date to the early 20th century while the vault itself rests upon corbels that date back to the 13th century. Another relic is the Marksburg Palas or Romanesque Great Hall that was built in 1239 with adjacent apartments. We also visited an impressive armory chamber with its stunning collection that stretches from 600 B.C. to A.D. 1500; a torture chamber exhibition housed in the former stables; and finally, the castle forge (blacksmith shop). 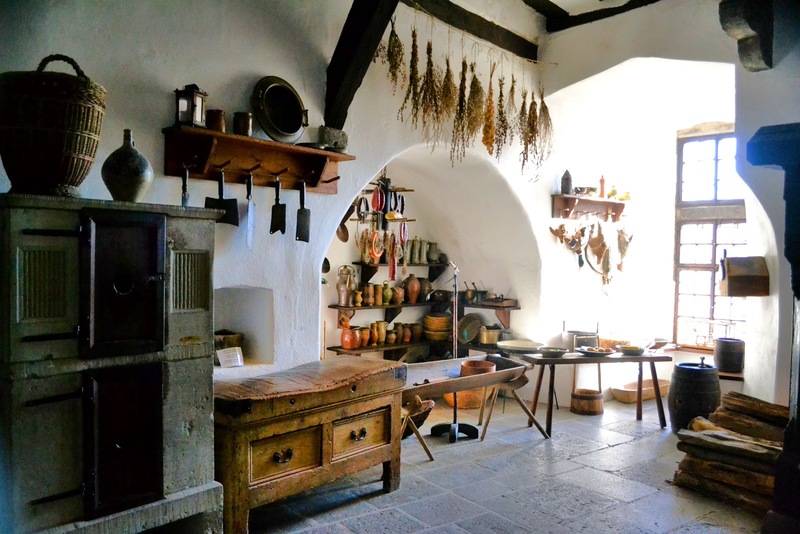 Marksburg Castle kitchen dates back to 1435 and today, can be reserved for medieval meals and festivities. 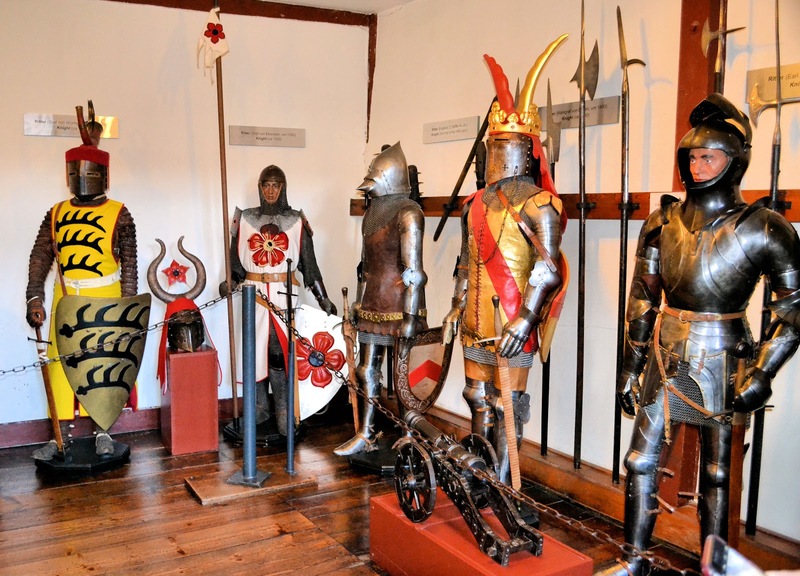 Marksburg Rüstkammer or Armory Chamber contains a remarkable collection that spans 2,000 years, from 600 B.C to A.D. 1500. 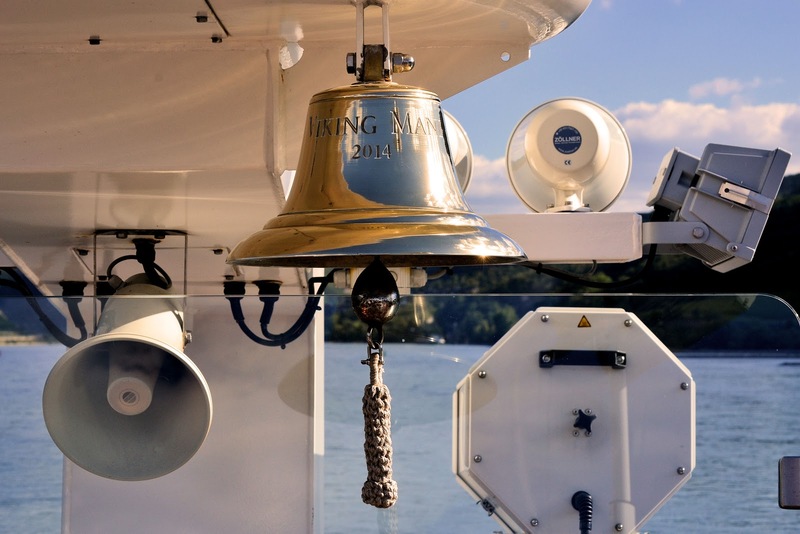 With nothing ahead but the open waters, we charted our course and set sail into the past and present for an unforgettable voyage on a castled Rhine. 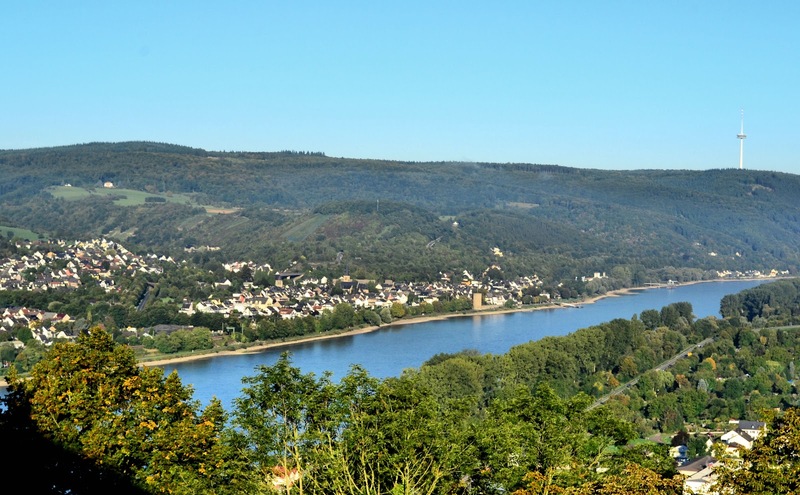 This view of the venerable Rhine was taken from Marksburg Castle. Beyond the flowing waters, Brey and Rhens lie on the opposite bank. 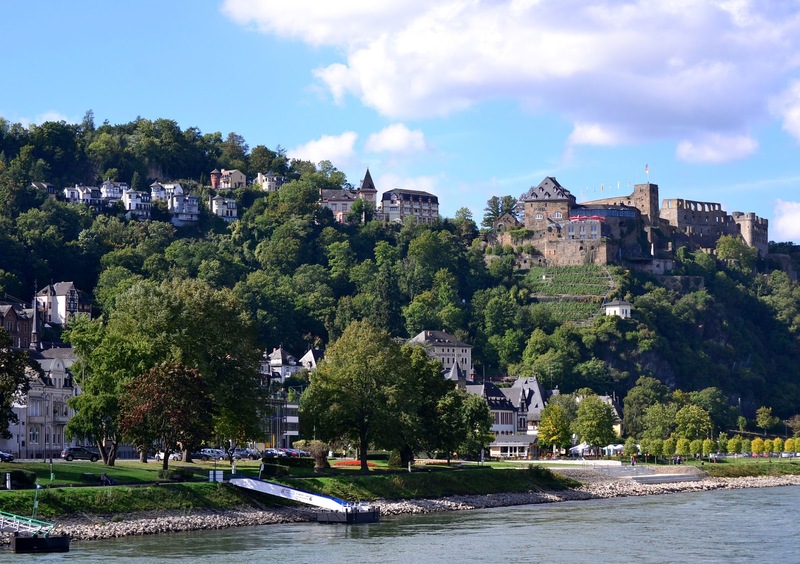 Truly, one of the highlights of any Rhine voyage is the stretch of the river that contains the highest concentration of castles—the Middle Rhine from Koblenz to Mainz, and this was how we were going to spend our afternoon. I imagined every bend in the river opening a doorway to nearly every century over the last 1,000 years. 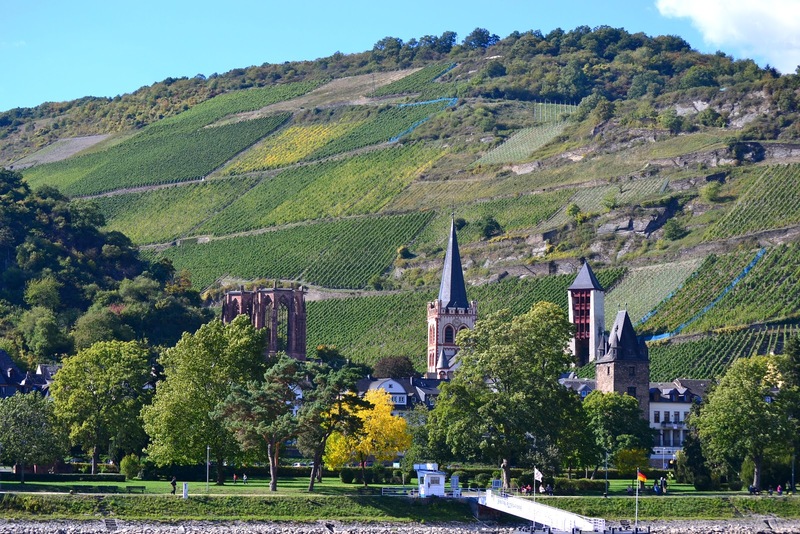 Follow along and enjoy this guided tour, a pictorial souvenir of sorts from the Rhine. The Aquavit Terrace makes for a wonderful viewing platform as you make your may through the Middle Rhein. A tragic past plagues the Castle Sterrenberg, one half of the Hostile Brothers. A tragic history plagues these two castles built by two feuding brothers in the 13th century. After waging war against each other for years, they reconciled and established a tradition of shooting early-morning arrows to greet the other. But on one fateful day as one of them opened his window in the early morning, he was struck accidentally with an arrow shot by his brother. Castle Liebenstein is the other of the Hostile Brothers. 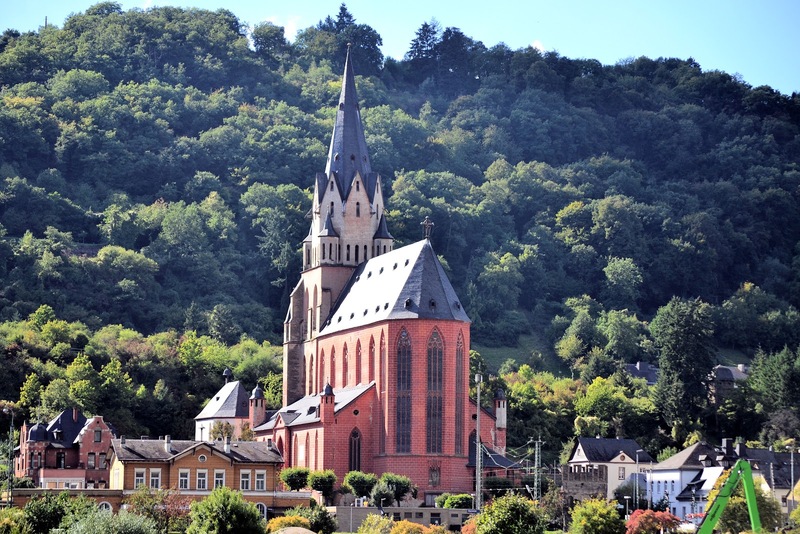 Their castles rise above the pilgrimage site of Kamp-Bornhofen, home to a Gothic church, Franciscan monastery and nunnery that are visited every year by religious travelers. 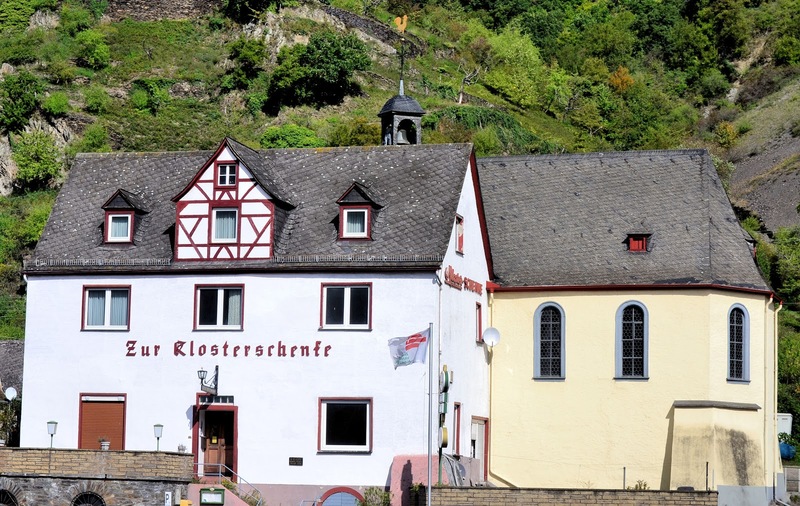 Zur Klosterschenke combines worship with drinking in one stop. Note the rooster at the top of the cupola indicating a Protestant Church. Undoubtedly, one of the most interesting churches I have ever seen is attached to a pub—Zur Klosterschenke and the only way to enter is through the tavern. Conveniently enough, wine cellars lie beneath the church. Burg Maus or Mouse Castle as seen from our Viking voyage on the Rhine. The old 'cat and mouse' game is how one of my friends described her exploration of two legendary castles: Burg Maus and Burg Katz, the latter described below. Situated above the village of Wellmich, the Burg Maus or Mouse Castle survives today due to preservation efforts of the early 20th century when it was restored to its original grandeur. 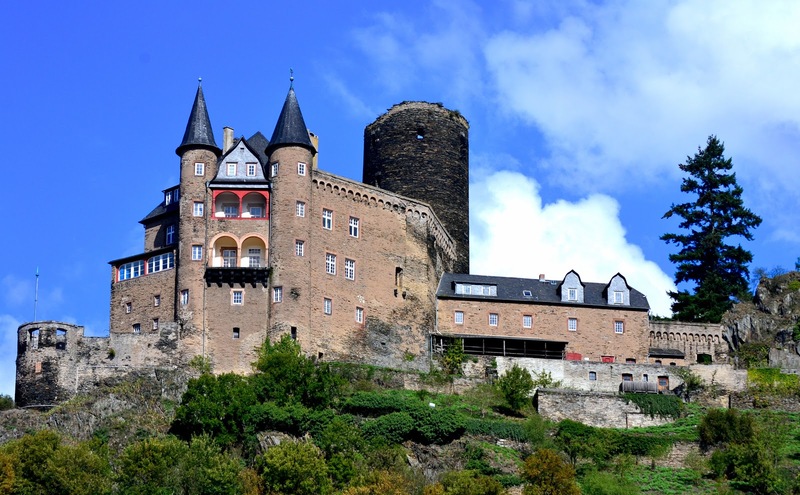 Most likely built to collect river tolls, this 14th-century fortress known as Peterseck at the time was commissioned by the archbishop of Trier and given the nickname "mouse" because of its striking similarity, albeit smaller, to the Burg Katz. 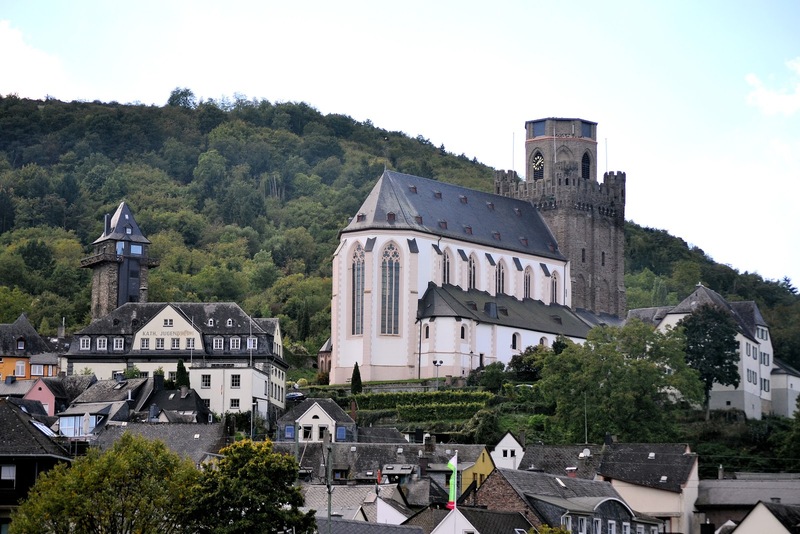 Saint Goar with Rheinfels Castle rising above the village in the background. 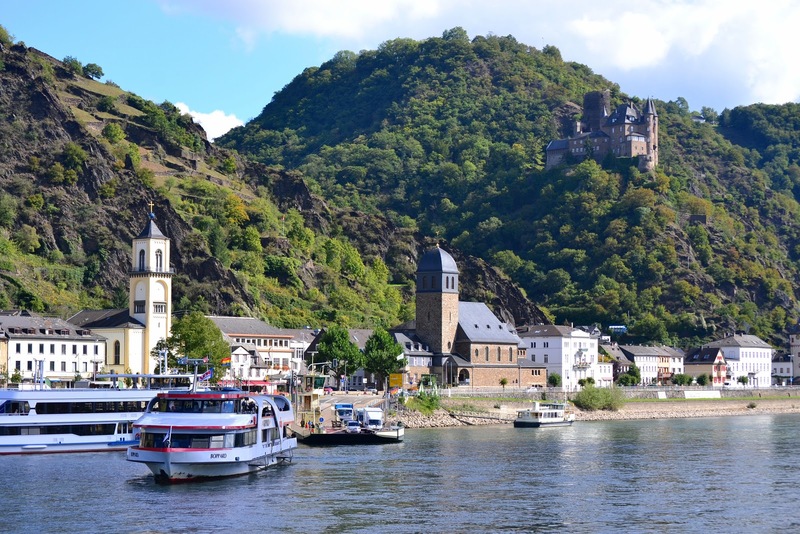 Saint Goar along the Rhine River in Germany. 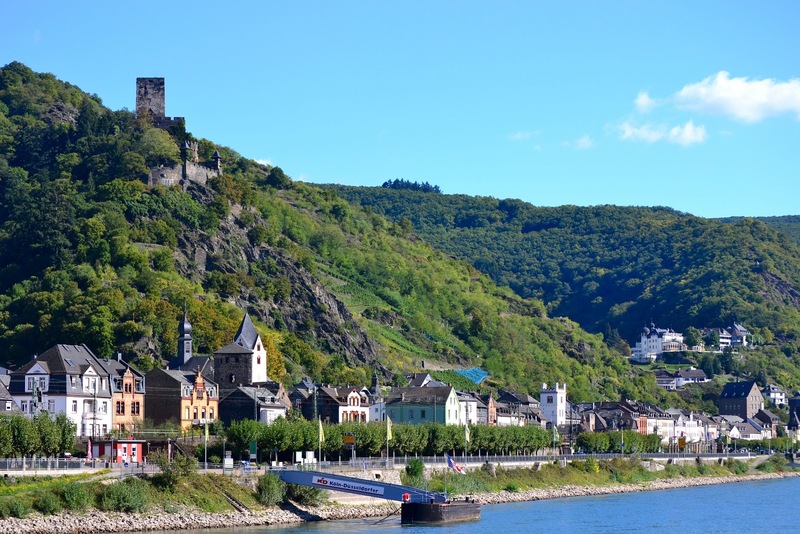 Named after a monk from Aquitaine, St. Goar is the patron saint of innkeepers, potters and vine growers whose bones were once housed in a crypt below the Romanesque church in the village—a year-round stop for travelers along the Rhine. Rheinfels Castle stands reborn today and is home to a hotel, restaurant, wine cellar and museum. 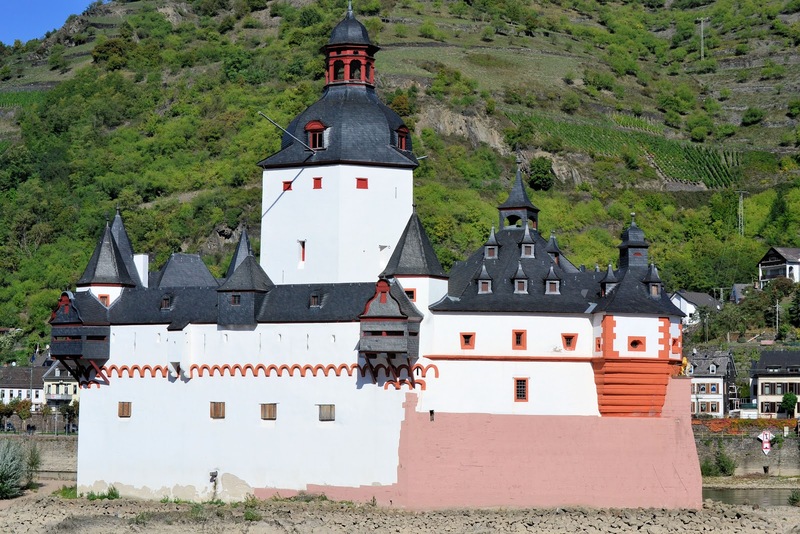 Once again, the Counts of Katzenelnbogen, specifically Count Diether V commissioned the construction of another Rhine castle—Rheinfels—one of the valley's largest and the Counts' only fortress on the left bank. After much of the castle was destroyed when it fell to the French in the latter part of the 18th century, Kaiser Wilhelm I, Crown Prince of Prussia purchased the Rheinfels in 1845 but had little interest as well as funding necessary to restore the castle. 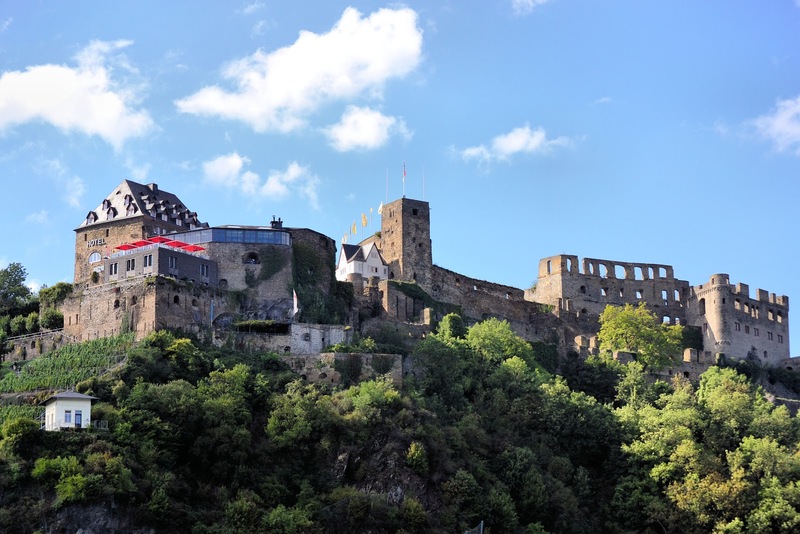 Thanks to the restoration efforts of the St. Goar city fathers, Rheinfels Castle stands reborn today and is home to a hotel, restaurant, wine cellar and museum. St. Goarshausen and Katz Castle in the background. Burg Katz or Cat Castle was restored to its grandeur in the early 20th century. Today, it is a private residence. 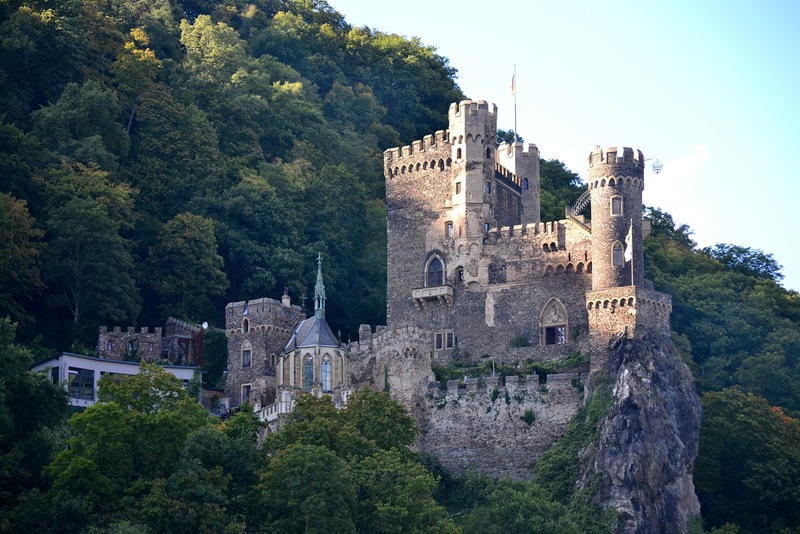 Enthroned upon her mighty Rhine ridge above Saint Goarshausen, Katz Castle, originally named Neukatzenelnbogen was built upon the northern edge of the Loreley massif in the latter 14th century. Ordered by Graf (Count) Wilhelm II, the castle fell to the Hessians when the Count's family died out at the end of the 15th century and together with Rheinfels and Reichenberg, they formed a powerful and formidable Hessian fortification that lasted nearly 300 years. When Napoleon entered the picture in 1806, he destroyed it and it wasn't until another 100 years had passed before the castle would be restored to its original plan. Today, it is a private residence (must be nice) and sadly, not open to the public. The Loreley Rock rises 430 feet above river in the narrows of the Rhine, only 350 feet wide at this point. Enshrouded in myth, this fabled bend in the Rhine near Saint Goarshausen, Germany, evokes the sounds of Wagner and rhymes of Heinrich Heine; yet spelled disaster for many a sailor who piloted this treacherous stretch of the river only to have his ship fall prey to the jagged reefs below the surface. 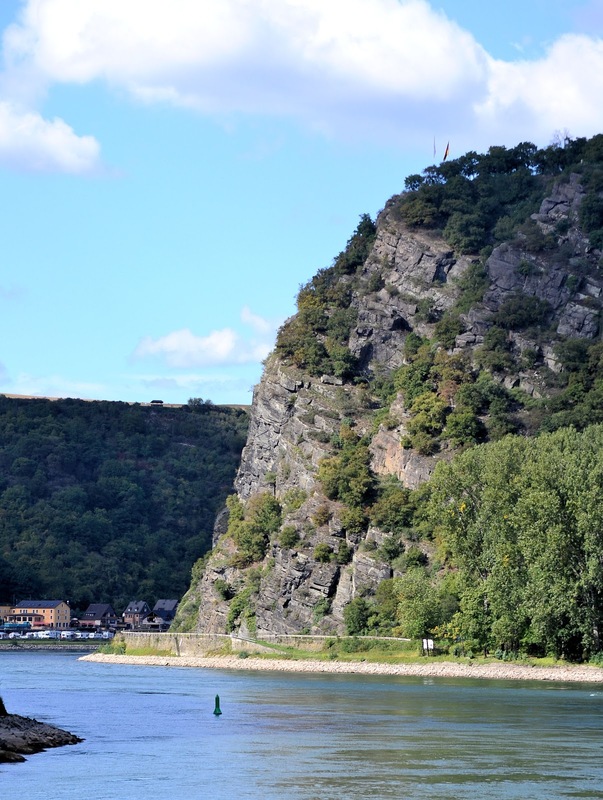 However, according to legend, it wasn't only the reefs to blame but the Loreley. Inspired by tales of the wrecks, German poet, Clemens Brentano first mentioned "Lore Ley" in his 1801 novel, "Godwi"; however it was Heinrich Heine who made famous the tale in his poem, "Legend of the Loreley"; a story about a lovesick maiden who lured the unwary sailor to dangerous currents with her bewitching song sang from high atop the cliff. Loreley originates from the words "ley" or rock, and "Lore" from lure. Captains and crews need no longer fear this stretch of the river due to the reefs having been removed recently however, the siren's song can still be heard echoing in the valley below. Loreley bides her time as she waits for the unwary sailor. 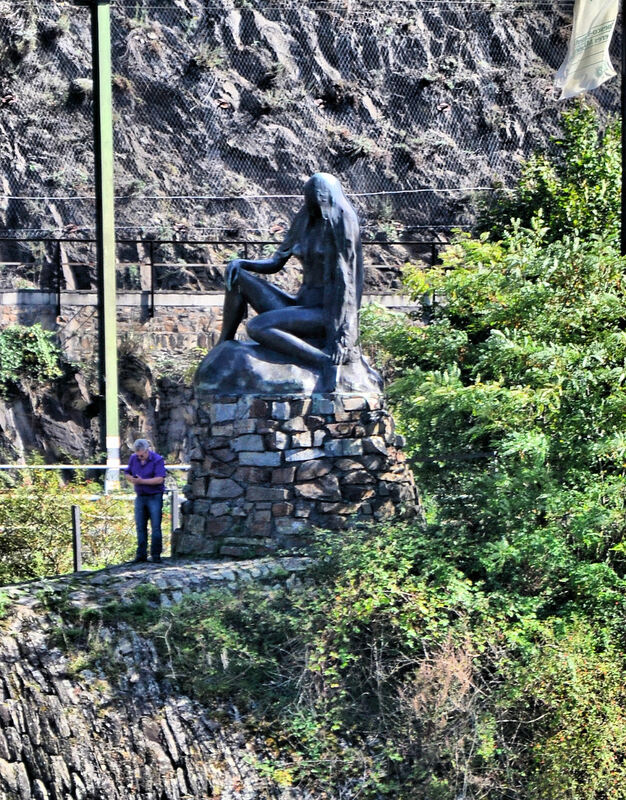 This is one of two Loreley statues, this one along the bank of the river and the other high atop the Loreley Rock. Today, the legend is sung when sailing through this storied passage and on board our Viking longship, it was no exception. As our cruise director George recited the poem, others joined in, some with a melody all their own. So perish the sailor and bark. Is the Loreley's gruesome work. 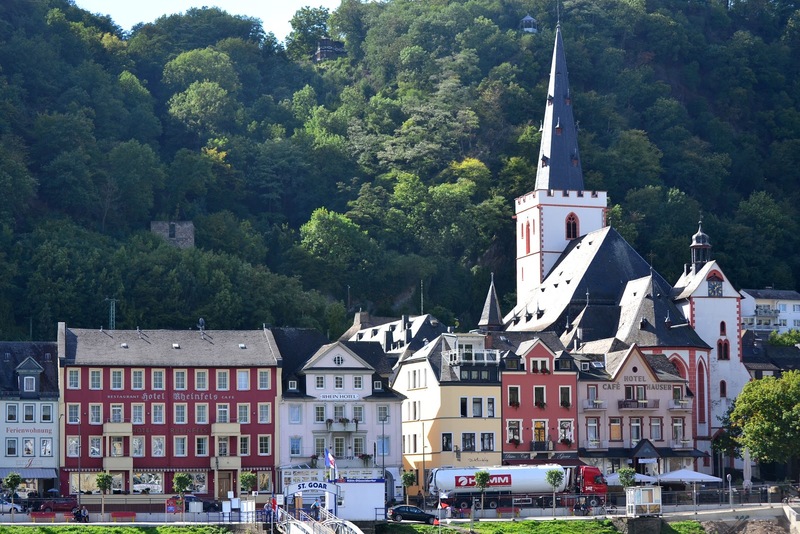 Oberwesel, Germany, lies on the banks of the Rhine River. St. Martin's Church rises alongside the vineyards in the background. Two of the original 21 watch towers stand to the left. Formerly known as Wesel until the 17th century, Oberwesel was born from a Celtic settlement even before the Romans. Near the end of the 12th century, the Dukes of Schönburg ruled Wesel until the 17th century. Sixteen of the original 21 watch towers in the town's wall survive and you can even climb one for fantastic views of the Rhine. The Catholic Church of Our Lady dates back to 1308 and is home to one of the Rhine's most treasured artifacts—the Golden Altar dating back to the High Gothic. Inside the Gothic Liebfrauenkirche (Church of our Lady) dating back to 1308, you'll find one of the most significant and exquisite pieces of art along the Rhine—the handcrafted golden altar is one of the Germany's oldest treasures from the High Gothic. 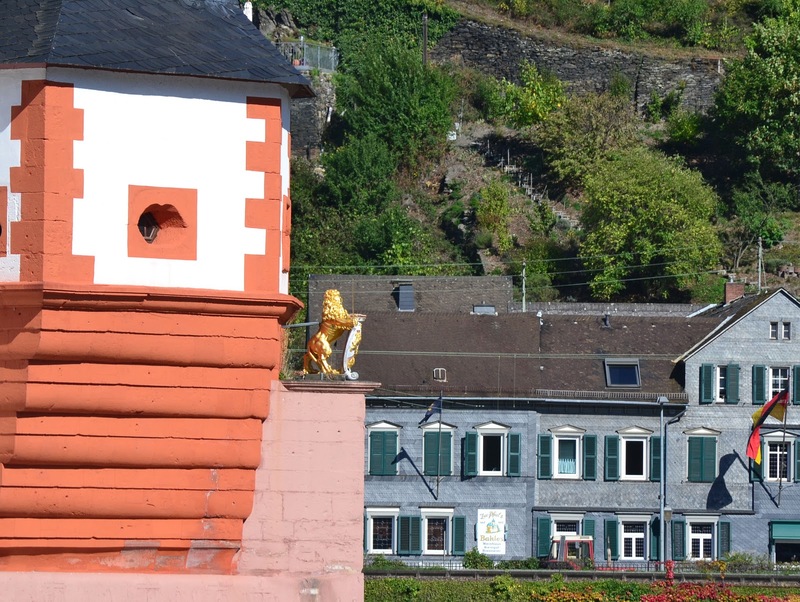 Close-up view of St. Martin's Church and one of Oberwesel's 12th-century watchtowers to the left. Today, the Schönburg Castle is home to a hotel, restaurant and adjacent Youth Castle Hotel. Dating back to the 10th century, the Schönburg Castle welcomed many new owners until Louis XIV destroyed it in 1689. In 1885, a New York business man whose surname, believe it or not, was Rhinelander, purchased the ruins and began restoration. 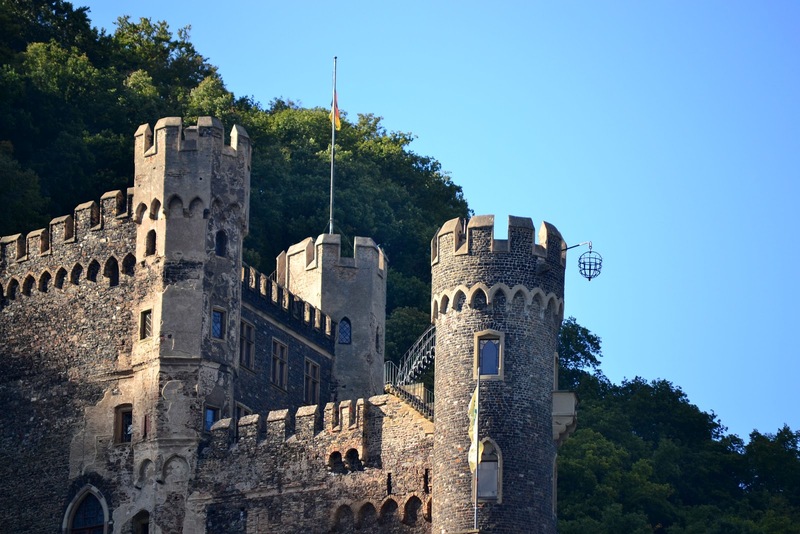 After living there for quite some time, Oberwesel took possession of the castle in 1950 and today, you'll find a hotel restaurant, and the adjacent Youth Castle Hostel. 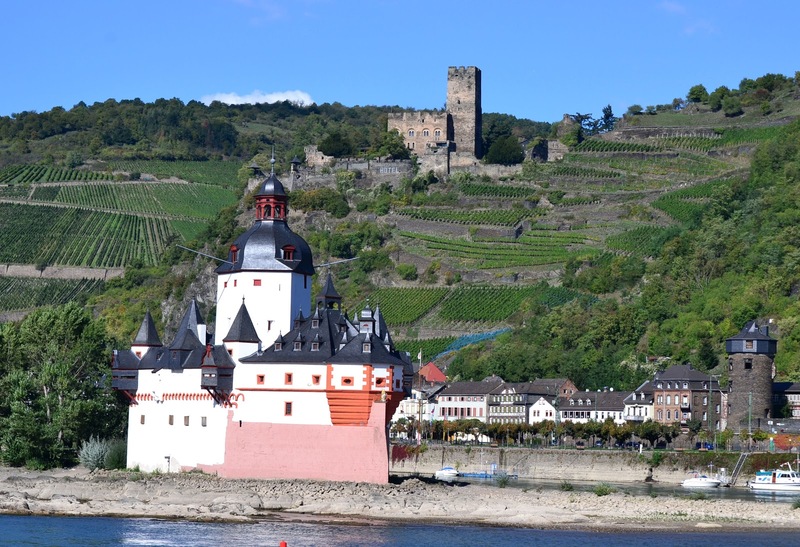 Schönburg Castle looms high above the town of Oberwesel, Germany. Gutenfels Castle or "The Good Rock Castle" dates back to the 13th century. 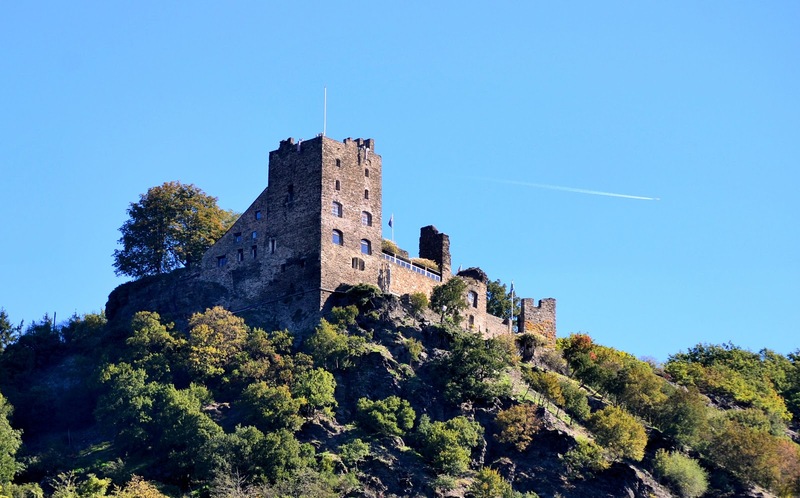 Perched above the town of Kaub, Gutenfels Castle is yet the result of another major restoration effort near the end of the 19th century. Originally owned by Falkenstein in 1277, the castle's name derives from the "ein guter fels" (the good rock) as testament to its survival through many a siege in the Middle Ages. Although Napoleon ordered the castle's dismantlement, rebuilding started in 1888. 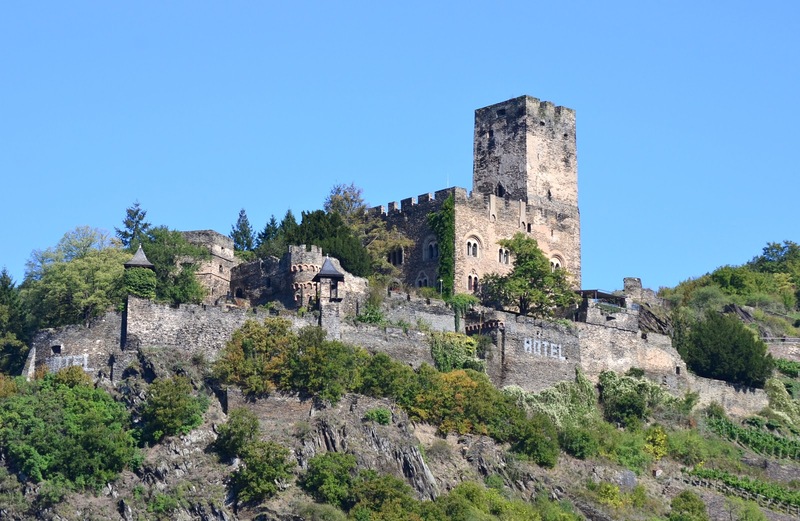 Like the Schönburg, it's a hotel with fantastic views of Rhine as well! The town of Kaub with Castle Gutenfels perched on high. Pfalzgrafenstein Castle aka the Stone Ship resembles a passing steamer on the river. 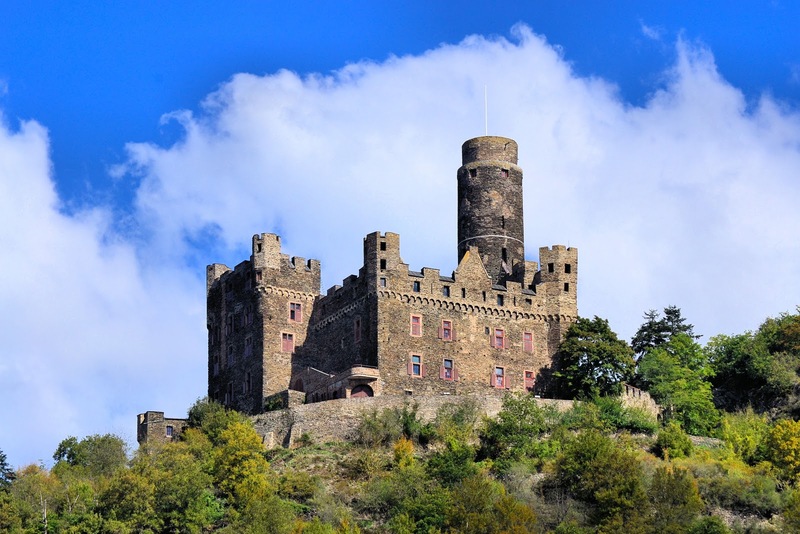 At first glance, Pfalzgrafenstein appears to be a steamship sailing up the Rhine but on closer inspection, it is indeed a remarkable fortress erected on Pfalz Island and Kaub's most popular attraction today. Built by King Ludwig of Bavaria in 1326, note the golden lion coat of arms at the "bow" of the stone ship, Pfalz castle was constructed to collect tolls and for those unfortunate souls who could not tender payment, into a 30-foot-deep well they were cast until their bail was paid. Close-up view of Pfalzgrafenstein Castle. Ludwig's coat of arms, golden lion and shield, decorate the front of the castle facing upstream on the Rhine. Considered the "greedy tax collector from Bavaria," Ludwig was excommunicated by the Pope because wine shipments from the Papal monasteries became more expensive. To protect his customs tower from Papal sieges as well as those from nearby nobles, Ludwig had to fortify his castle with walls eight feet thick and 40 feet high which inevitably proved successful since tolls were collected until 1866 when the Prussians ceased operations. 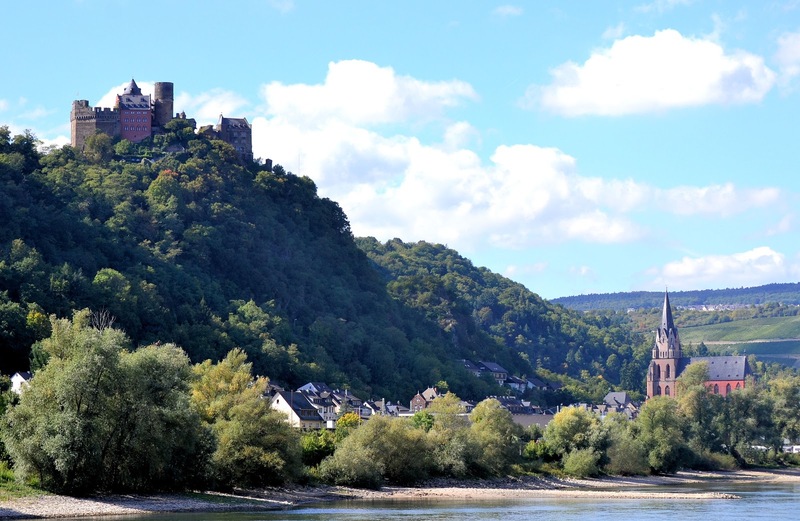 A parting shot of Gutenfels and Pfalzgrafenstein Castles. At first glance, Stahleck Castle conjures images of Hogwarts. 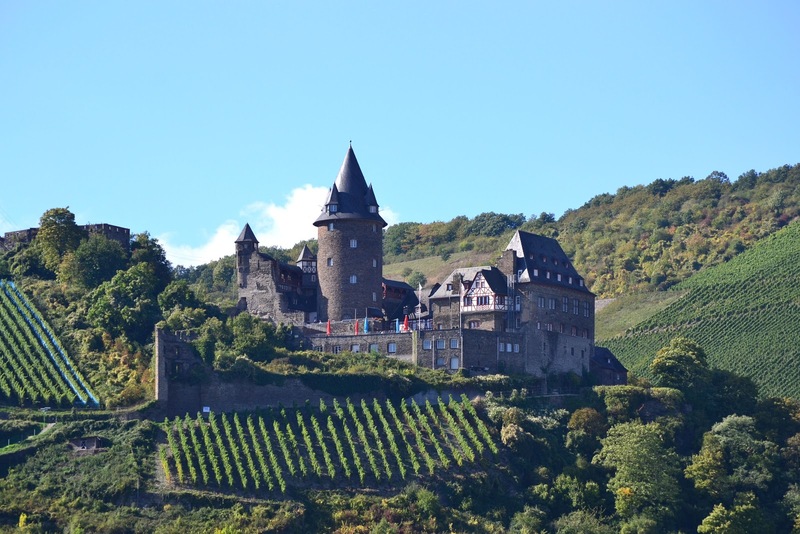 When I first spied Stahleck Castle above medieval Bacharach, my imagination conjured Hogwarts for its central tower capped by a soaring spire scraping the sky. 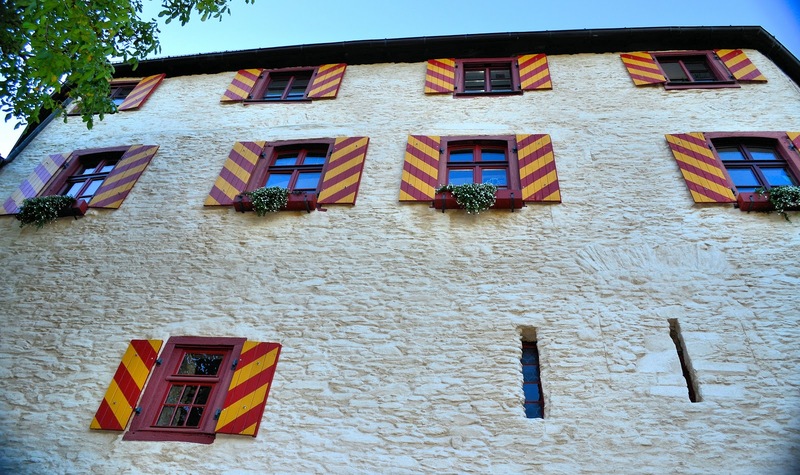 Dating back to the 12th century when the Seigniors of Stahleck became Palatinate Earls. And with new titles, came lavish new palaces. Despite a tumultuous history in which the castle was destroyed not once, but twice during the 17th century—first by the Swedish and second by none other than Louis XIV, the castle was restored in the early 20th century and today houses a youth hostel. Stahleck was restored in the early 20th century and today, houses a youth hostel. 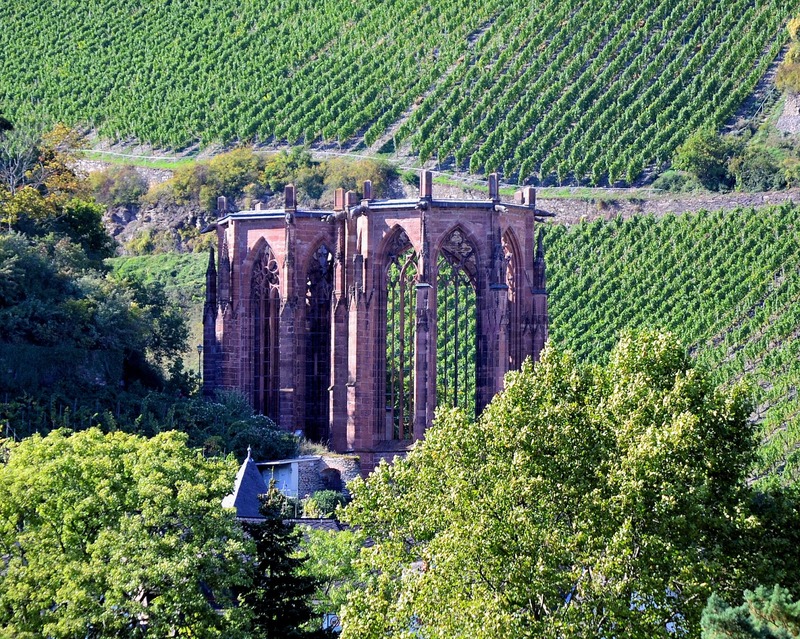 Surrounded by vineyards clinging to the hills along the valley, (note the blue coverings on some of the vines—for ice-wine production), Bacharach is the probably the best-preserved medieval town along the Rhine. Victor Hugo eloquently and fancifully describes his three days in "The Rhine," a marvelous collection of stories about his experience. Stroll along the cobbled streets in this pedestrian-friendly village since motor vehicles are restricted to the outermost reaches of the town. Bacharach and Werner Chapel ruins to the left. Werner Chapel ruins serve as a reminder of darker times in the 13th century when the unexplained death of a 16-year-old boy led to the persecution of Jews in 13th century. Despite its strikingly beautiful ruined state, the Werner Chapel is cloaked in darkness, a tragic past that spawned the persecution of Jews throughout the the middle- and lower-Rhine valleys in 1287. Built in 1426, the chapel was dedicated to Saint Werner of Oberwesel, a 16-year-old boy whose unexplained death was blamed on a Jewish ritual. Thankfully, this falsehood was disproved. 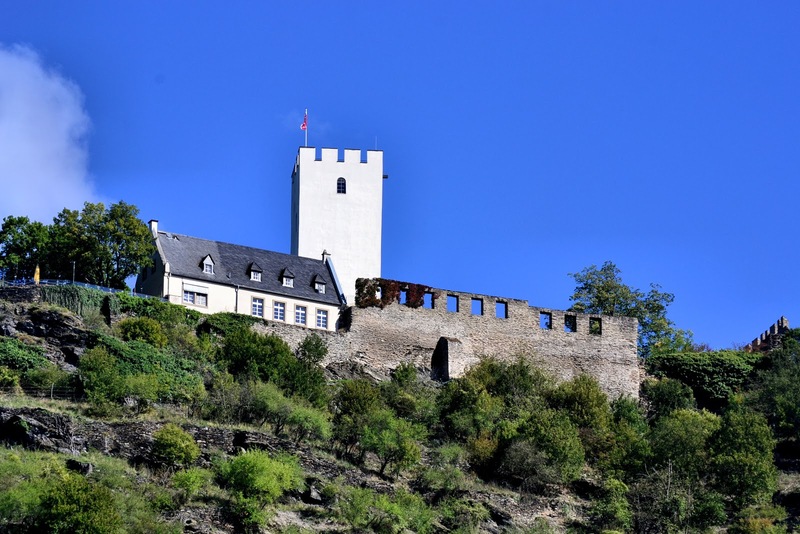 Reichenstein Castle is one of the Rhine's oldest and dates back to the 11th century. One of the Rhine's oldest, Reichenstein was constructed in the 11th century to protect the surrounding community but 200 years later, its owner became a robber baron who illegally charged exorbitant tolls until the League of Rhenish Cities, an alliance of Rhine River cities, organized an attack on Philipp of Hohenfels and destroyed the castle in its wake. It wasn't until 1834 when General Baron Wilhelm of Barfuss bought the pile of rubble and began restoration in order to establish his residence. He later named it Falkenburg. In 1899, the rest of the castle was restored by industrialist Nicolaus Kirsch-Puricelli. Rheinstein Castle was originally named Fatzberg by the Archbishops of Mainz when it was built in the 13th century. Nearing the end of our Rhine castle tour, we wrap up with one of my favorites—Rheinstein Castle. Another of the oldest castles in the valley, Rheinstein dates to the early 13th century and ironically enough, was used as protection from neighboring Reichenstein. 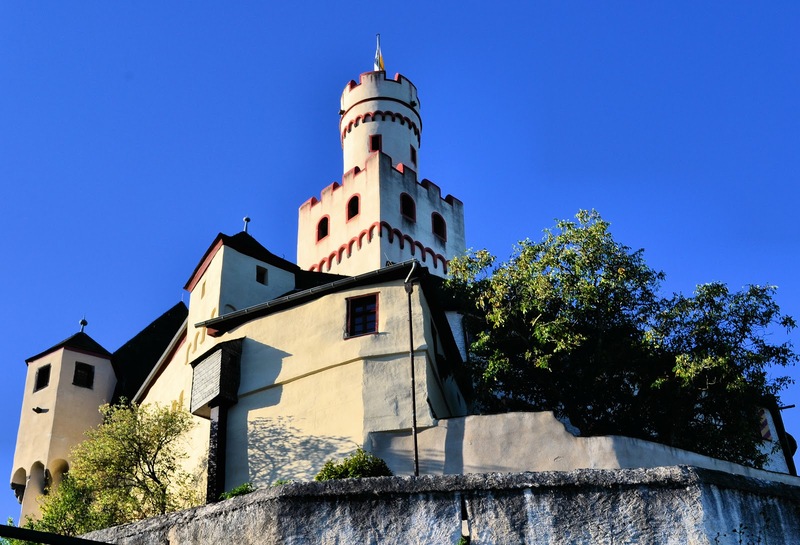 Originally named Fatzberg by its owners Archibishops of Mainz, the castle was home to the Holy Roman Emperor Rudolph von Habsburg near the end of the 13th century. During his tenure, he ruled on robber-baron cases and when punishment was warranted, he had them placed into the circular cage and suspended from the castle's tower. Look carefully and you can still see the cage hanging just as it did in the 13th century. Sadly, the fortress fell into disrepair until finally, in 1823, Prince Friedrich von Preussen purchased the ruins for 100 marks ($55) and renamed it Rheinstein. In 1975, Opera singer Hermann Hecher purchased the castle and today, he and his family operate tours and a café overlooking the Rhine! When unruly robber barons were punished, they were suspended in the circular cage at the right of the tower. And so our guided tour comes to an end. I hope you enjoyed this voyage to the past and present of the castled Rhine. A parting shot of Oberwesel as our voyage on the castled Rhine comes to an end ... for now. 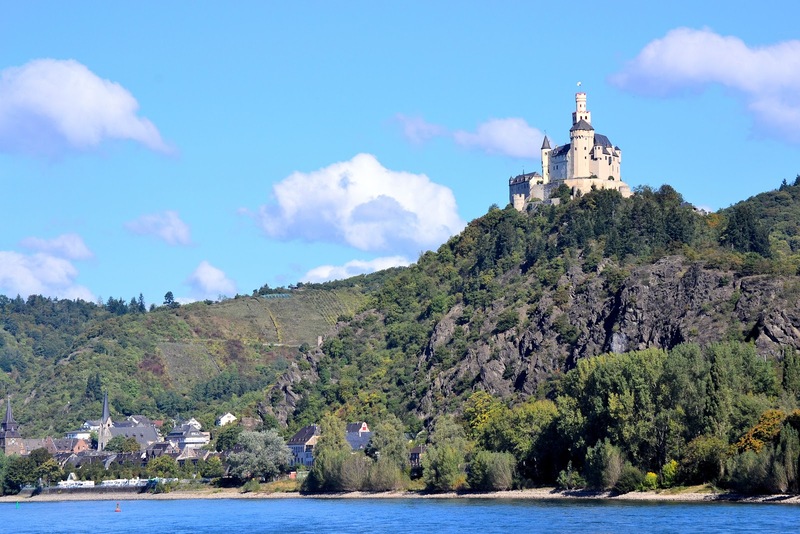 A very special thanks to Viking River Cruises for inviting me on the "Rhine Getaway," a fantastic voyage along the Rhine River in Germany—a lifelong dream finally realized. Of course, all opinions are mine however, unforgettable moments like these can be yours as well! What I love most about these river cruises in Europe is that you go directly to the heart of the country and the town. It's like a magic way to known the best of all small and big cities in Europe. Fabulous! I couldn't have said it any better, Agata! 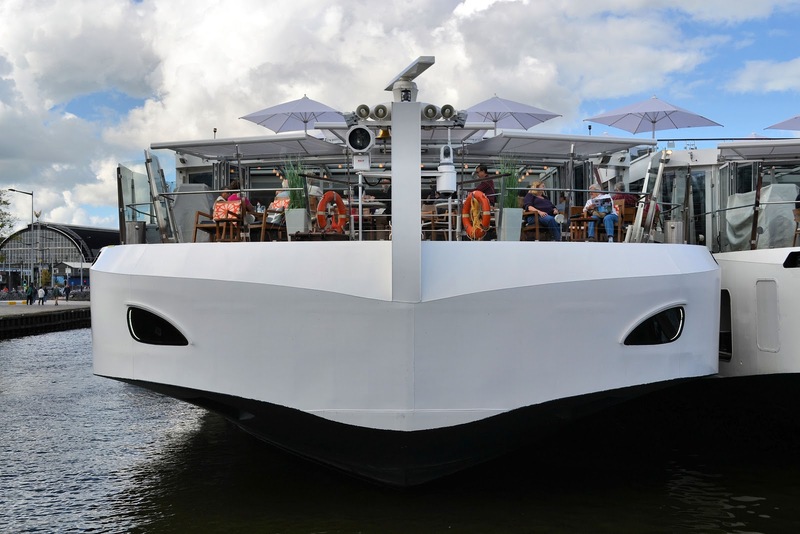 If you're seeking cultural immersion, then river cruising is the way to travel in Europe! It's a great introduction to all of the places you'll visit so you can then map your triumphant return! Thanks so much for stopping by and sharing your thoughts! I'm very jealous, Jeff. We almost booked this river cruise in August, but then my husband changed his mind and booked a cruise to Alaska instead. Quite in the opposite direction. I would liked to see the Rhine Valley and all these beautiful castles rather than go to Alaska, but in the end I didn't regret it. I love strolling along the cobbled streets of Europe, though. My heart belongs there, although I call America home now. Hi there Anda! Wow, Alaska must have been so incredibly spectacular--the mountains, the fjords, the wildlife and the sea! Not a bad alternative to the Rhine I must say. Since the hubby chose Alaska, it's only fair that you have your Rhine next year! Please stop back and let me know WHEN it comes to fruition. Thank you so much for stopping by and sharing your thoughts!! So gorgeous and mysterious this stretch of the Rhine. I drove along the banks here this autumn, but would love to explore it all from the river itself. HI Sophie! I couldn't agree with you more my friend! I want to drive up and explore many of the villages we visited and others we passed by. Most of all, I want to stay in one of those castles as well!! Thanks so much for stopping by and sharing your experiences! I love to read about other journeys! All those castles have their own styles - and backstories. That's a really sad the story of those two brothers. Wouldn't be surprised if his spirit doesn't still linger in the castle. Hi there Marcia! I learned as we toured as well as my post research about each of the castles along the way. Actually I gasped when I read about the Hostile Brothers, such a tragic story indeed. Thanks so much for stopping by and sharing your thoughts. This is a gorgeous travel story. Your photos put us right there with you on the Rhine! I have had the vague notion that I would like to do this someday and reading the histories of the individual castles and seeing them in context makes me really ready to go! Thank you for sharing your trip with us! Hi Laura! I am so glad you enjoyed the post! This voyage through the Middle Rhine was truly one of the highlights of the entire trip and a dream come true for me. Thank you so much for your kind words, I really appreciate it! What gorgeous photos, Jeff! As a child I was totally addicted to fairy tales and when I found out that castles really existed, I vowed I'd go see them! Haven't made it to the Rhine yet, it looks a true fairy tale landscape. The view from the river would really be the best! Hi there Lesley! Thank you so much for your kind words, I really appreciate it! I too dreamed of visiting these castles ever since high school when one of my close friends use to visit Germany every Christmas and tell me of her tales. I finally made it! You will too! Thank you for stopping by and sharing your memories! Thank you my Anonymous friend! I am glad you enjoyed the article. This seems like a wonderful trip. I love visiting castles and finding out about their history. I always get the feeling that if those walls could speak, they would have some interesting stories to tell. The photos are also great! Hi there Luminita and thanks so much for stopping by to share your thoughts and your kind compliments. This voyage was a real dream come true for me and I strongly urge you to do the same someday soon. Great place for trip. Thanks for inspiration. Thank you Patryk for stopping by and sharing your thoughts! Wow, one amazing castle after another. One of these castles would make a trip, but to have one after another on such a historic river way must have been an incredible experience. Hi there Ted and thanks so much for your comment too! This was a dream-come-true journey for me as I have wanted to sail the Rhine for years now. We were so blessed with the magnificent weather you see in the photographs above. Each castle was one thrill after the next during this eventful afternoon on the River Rhine!! Thank you so much Tazz! Have you been to the Rhine or sailed with Viking?